This publication is an archived publication and may contain dated technical, contact, and link information. In the 21st century, strategies to manage demand will be more critical to transportation operations than strategies to increase capacity (supply) of facilities. The inability to easily and quickly add new infrastructure coupled with the growth in passenger and freight travel have led to the need for transportation system managers and operators to pay more attention to managing demands. The original concepts of travel demand management (TDM) took root in the 1970s and 1980s from legitimate desires to provide alternatives to single occupancy commuter travel to save energy, improve air quality, and reduce peak period congestion. 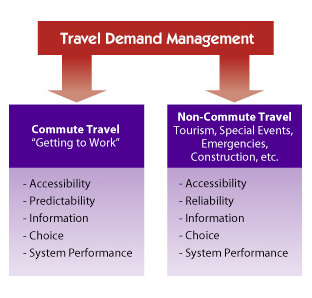 Today, managing travel demand has broadened to encompass the desire to optimize transportation system performance for commute and non-commute trips and for recurring as well as non-recurring events. Growth in population, number of vehicles and travelers, freight, and development has affected travel demand and reshaped travel patterns. Managing travel demand now occurs at shopping malls, tourist sites, employment areas, and special events such as the Olympics. The need to manage demand can occur in the middle of the day, evenings, or on weekends. Demand-oriented approaches are needed to address the transportation issues created by growth and the variability in demand for use of the systems. 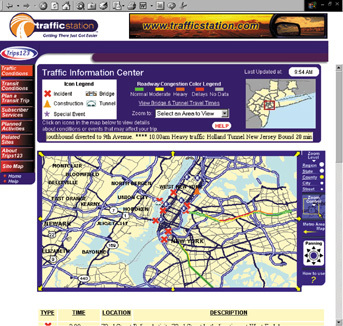 The availability of information about transportation services and conditions has been shown to influence travel demand. Information affects demand by influencing the choices that people make about how, when, where, whether, and which way they travel to their destinations. In the 21st century, the need to deliver information to help manage transportation demand will grow and be supported by Intelligent Transportation Systems (ITS). Today, the concept of TDM takes on a broader set of transportation goals due to greater need to manage demand in multiple situations and conditions as well as the influence of information and the technologies to deliver it. A more contemporary model of TDM is emerging and may be diagrammed as follows. Managing demand can no longer stop at encouraging travelers to change their travel mode from driving alone to choosing a carpool, vanpool, public transit vehicle, or other commuter alternative. Managing demand today is about providing all travelers, regardless of whether they drive alone, with choices of location, route, and time, not just mode of travel. Information and the technology to deliver it to travelers are beginning to have significant impact on managing demand for commute and non-commute situations. Real-time information systems can now let travelers make better decisions about how they travel (mode), when they travel (time), where and whether they travel (location), and which route they travel (path). Real-time traveler information systems can be used at employment centers and to manage critical shifts in demand such as occurs for special events, tourist activity, incidents and emergencies, schools, shopping centers, recreation areas, medical facilities, weather problems, and reconstruction projects. The Federal Highway Administration's (FHWA) Office of Operations has a two-pronged action agenda of awareness and guidance to promote a 21st century perspective on TDM. Awareness: A new Commuter Choice Primer has been prepared to help employers give their employees a wider range of opportunities for "getting to work." This primer is part of an ongoing joint initiative with the Federal Transit Administration and the U.S. Environmental Protection Agency, called Commuter Choice-Best Workplaces. To address non-commute travel, FHWA will showcase best practices of travel demand management techniques that make use of real-time information. Guidance: A new TDM reference manual and better technical analysis tools will be delivered over the next three years. They will provide the details to enable operations-oriented agencies to make demand management a key strategy to meet their 21st century operations needs.